US Democratic presidential front-runner Hillary Clinton began Monday a two-day tour through Kentucky, West Virginia and Ohio, a region that has been economically devastated by the collapse of the coal industry and where she will try to regain some lost votes. Clinton defeated Obama in 2008 in West Virginia, but has since broadly endorsed the federal government’s clean air policies, and now trails far behind Donald Trump and Bernie Sanders. She defeated Obama in 2008 in West Virginia, but has since openly endorsed the federal government’s clean air policies, and now trails far behind Donald Trump and Bernie Sanders. To make things worse, she said last month in a televised speech she would put coal companies and miners out of business, which has cost her mounting criticism and support. She has since said those comments were taken out of context, and that she is standing by coal communities, but analysts doubt she’ll be able to avoid a “protest vote,” especially in hard-hit West Virginia. The candidate has mostly focused her campaign messages on coal workers and their families, rather than addressing the difficulties producers of the fossil fuel have been facing. Throughout her campaign she has criticized attempts made by coal companies to avoid the responsibility to pay healthcare benefits for retirees during bankruptcy proceedings, saying the country owes them gratitude for fuelling decades of economic success. Clinton has also promised she’ll spend more than $30 billion to revitalize communities dependent on coal production, as part of a broader agenda based on switching to clean energy. Last month, Peabody Energy (NYSE:BTU), the US largest coal producer, filed for bankruptcy protection. The move followed on the heels of similar actions by four major US coal companies last year — Arch Coal, Alpha Natural Resources, Patriot Coal Corp. and Walter Energy. 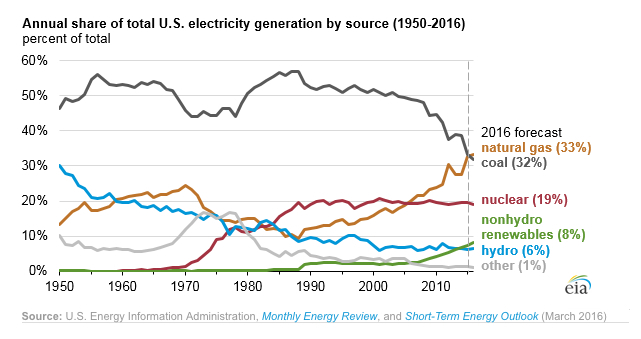 As a result, the nation’s total output fell to 900 million short tons in 2015, data from the Energy Information Administration shows, a 10% decline on the previous year.